The New Moon on Monday October 8, 2018 falls at 15° Libra. 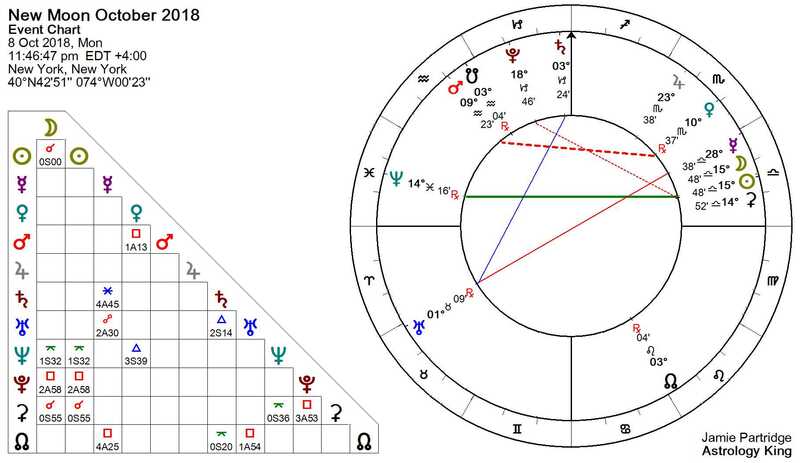 The New Moon October 2018 astrology is similar to the January 2018 lunar eclipse. They both make exactly the same aspects to Neptune and the minor planet Ceres. Expect to feel more sensitive, sympathetic and comforting towards your loved ones. This new moon brings attention to the rights and conditions of women in nontraditional families, single women, working women and single parents. The October 2018 new moon square Pluto adds drama and intensity. A health or relationship crisis may force a radical transformation. You may have to become ruthless in eliminating poison from your life. This is a good new moon for starting a new diet, exercise or detoxification regime. The effects of the October 8 new moon will last four weeks up to the November 7 new moon. The best time for making a fresh start and for beginning new projects is during the first two weeks of this new moon cycle. This waxing phase of the Moon lasts from October 8 to the October 24 Full Moon. At 15°48′ Libra the October 8 new moon is less than one degree from minor planet Ceres. The lunar eclipse on January 31, 2018 was also conjunct Ceres so similar issues will probably arise in the next four weeks as in the first half of this year. Furthermore, both moon phases quincunx Neptune makes it almost certain that you will be dealing with similar circumstances, relationship issues, or people as earlier in the year. But although the aspects to Ceres and Neptune make both moon phases very similar, they influence you in different ways because the lunar eclipse was at 11° Leo while the October 8 new moon is at 15° Libra. Notice that they roughly 60 apart so are in sextile aspect. This means they work together well so you can easily resolve ongoing problems, finish things you started back then, or further develop and perfect new skills you have worked on this year. New moon October 2018 is also square Pluto which adds drama and intensity to existing issues. It could also result in completely new problems related to power and control issues. Finally, there are some minor fixed star around 15° Libra which give a more positive flavor to this challenging new moon. So New Moon October 2018 should make you more sympathetic and comforting towards your family and especially children. You may want to care for others but don’t forget to nurture yourself. Showing your warm and protective nature can also make you more attractive to you partner or potential partners. The October 8 new moon will focus attention on the rights and freedoms single mothers and working mothers. Social discussions and political debate in this moon phase will include parenting styles, custody rights, maternity leave, childcare and equal pay. 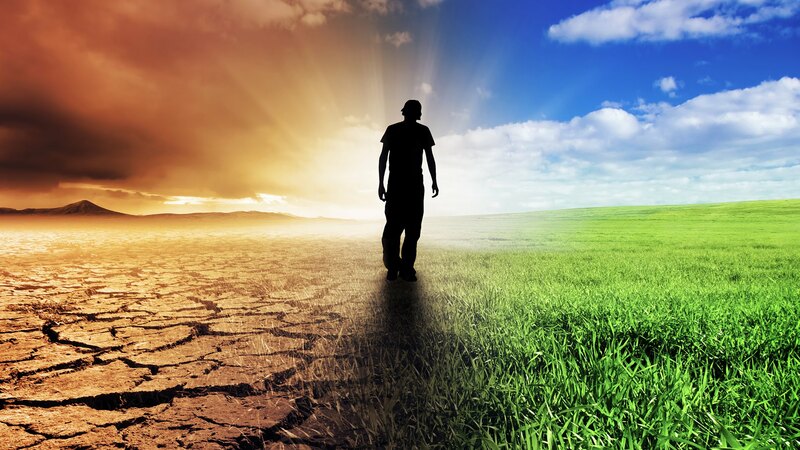 The environment and climate change should also be topical, and how they affect food production. Other planetary aspects mentioned below also point to concern about chemicals like pesticides, plastic packaging and growth hormones. Then there are the effects of genetically modified foods, excessive amounts of sugar, and even more suspect practices of multinational food corporations. Sun quincunx Neptune brings glamour or intrigue to your life, or a delicate balance between the two. This balancing act can also manifest as savior and victim, or saint and sinner. It is important to believe in what you are doing because confusion about your identity would lead to a lowering of self-esteem. Neptune rules mirrors and cameras so use these tools to improve your self-esteem if needed. Stand in front of a mirror and repeat positive affirmations. If you feel guilt or shame about your body image then use your webcam of iPhone and get naked. No one has to see or know about it. With Ceres ruling food and diet, the quincunx aspect to Neptune brings the potential for imbalances in health and hygiene. A healthy ego requires a healthy body, so clean living, a healthy diet and exercise are most important. Neptune could make you more sensitive to poisoning from food and the environment. Take precautions to avoid infection, food poisoning and overdose. Poisoning at the spiritual level may also affect your relationships. It is important to surround yourself with positive energy. If you hang around losers and junkies then you could easily morph into one. Sun square Pluto increases your need to be in control, but can also lead to ego conflicts with other powerful people or authority figures. A crisis or conflict could lead to extreme or destructive behavior. Bullying, threats or intimidation could force you into a corner, where you have to either defend your position or make a major change. Such intense experiences may trigger deeply buried psychological issues involving fears of death, losing control, abuse or persecution. Facing your fears will help you understand your need to be in control. This will help you evolve and let things go, relax and feel less threatened. This transformation or rebirth and will leave you with a greater sense of inner power. You can then channel your intensity into success through ambition and hard work. Ceres square Pluto could expose the dirty tricks that multinational food, drug and chemical corporations use profit from bad health. This could include toxins in the food chain from pesticides and herbicides, the effects of genetically modified plants and animals, excess sugar and artificial food additives. Other possibilities include power plays and ego conflicts over child custody, the abuse of power by employers relating to working mothers, and the marginalization of single parents by the Church and State. The October 8 new moon conjunct Ceres and quincunx Neptune makes it very similar to the January 31 lunar eclipse. So like the lunar eclipse, this new moon will focus your attention on the rights and conditions of women in traditional families, single women, working women and single parents. Trust and faith in yourself and in your belief system is again important in dealing with these ongoing issues. The Libra new moon square Pluto will likely intensify existing problems. You may have to deal with extreme or controlling behavior, conflict and drama that forces to face your fears. Pluto may also complicate or deepen other Ceres and Neptune issues, especially relating to your health. A complete transformation may be needed to improve your health. This could include investigations to find the cause of symptoms and seeking help for mental and physical health problems. This is a good new moon for starting a new diet or exercise program. Your body and mind may be due for a good detoxification. This is the right time to cut all things from your life that are unhealthy. This includes the common causes of illness like smoking, alcohol and sugar. Think about what you put into your body. Poisonous thoughts like revenge, jealousy and envy can make you ill and harm others. Bad habits and destructive behaviors can also be left behind now. The October 2018 new moon may force a radical transformation because of a health or relationships crisis. However, it would be better to make the first move and get ruthless about removing toxic influences in your life, whether they be in your diet, your relationships or in your mind. Finally, if you are a parent or look after your own parents, take this opportunity to improve their health and well-being. If the New Moon October 2018 astrology chart directly affects your Sign you can read about it in your free Weekly Horoscope and Monthly Horoscope. Finally, for more details about how it affects your natal chart see Sun Transits. Fixed Stars and Constellations in Astrology, Vivian E. Robson, 1923, p.58. How can it feels conjunct uranus ruler of 7 and 8 houses? Hi Jamie, should I understand that this moon will conjunct my natal Apollo (+/- 16•) and Pluto (19.54) or the orb is too wide? Many thanks for your discourt on this new moon that will be facing mine in Aries. Bravo for your work and disponibility.